It's quite easy with the conditional formatting to highlight the highest and lowest value of your series. In the dialog box, replace 10 by 1 and choose a format. 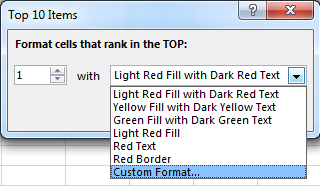 When you close the dialog box, instantly the highest value has a different format of the rest of your range of cells. To highlight the Top / Bottom 10 values of your data, you just have to use the same menu and let the parameter 10 in the dialog box. Here the question is not to activate the tool but how to use it consciously. For instance, it is no necessary to apply the parameter 10 for the column Average because you have more than 10 cells. But for your range B2:G9, that's more appropriate. In the dialog box, let the value 10. 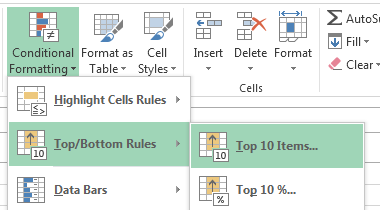 When you close the dialog box, instantly the top 10 values has a different format of the rest of your range of cells. The method to highlight the Top / Bottom 10 percent of your data, is exactly like for the value but in this case you select this menu. 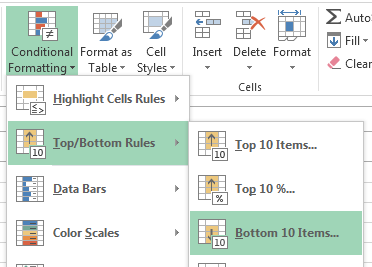 As you can see, the number of cells where the format is different is less than for the top/bottom 10 value. Here only the value between 18 and 20 (10% of your population) is highlighted. 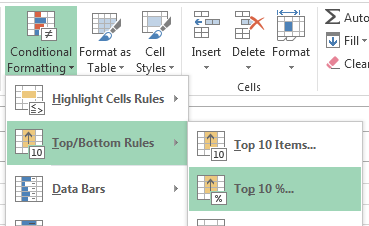 So if only one cell respect this rule, only this cell will be highlighted.